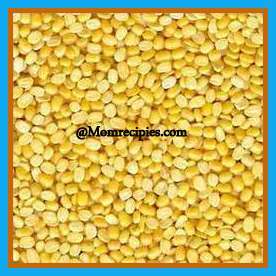 1) Wash and soak moong dal for 2-3 hrs.Rinse and drain the excess water. 2) Grind soaked moong dal with green chilies to a fine batter. 3) Transfer the Moong dal paste to a bowl, add the salt, sugar, asafoetida, oil, turmeric powder, besan ,curd and mix well to make a batter.The batter consistency would be some what similar to idli batter. 4) Just before steaming add eno or fruit salt to it and mix lightly.The batter would be frothy. 5) Immediately pour the batter into a greased flat steel vessel or dhokla container to 1 inch thickness and steam it for 10-12 mins or till the dhoklas are cooked. .You can use my pressure cooker to steam it and remove the whistle from it. Keep it aside. 6) Heat the oil in a small non-stick pan and add the mustard seeds. 7) When the mustard seeds crackle, add the slit green chillies and sauté on a medium flame for 30 seconds. 8) Add asafoetida and sauté for 30 seconds then switch off the stove. 9) Pour the seasoning over the prepared dhoklas and spread it evenly. 10) Sprinkle the finely chopped coriander on top. 11) Run a sharp knife in the edges of the dhokla and cut it into squares or triangle shape. 12) Serve hot with green chutney or tomato sauce.